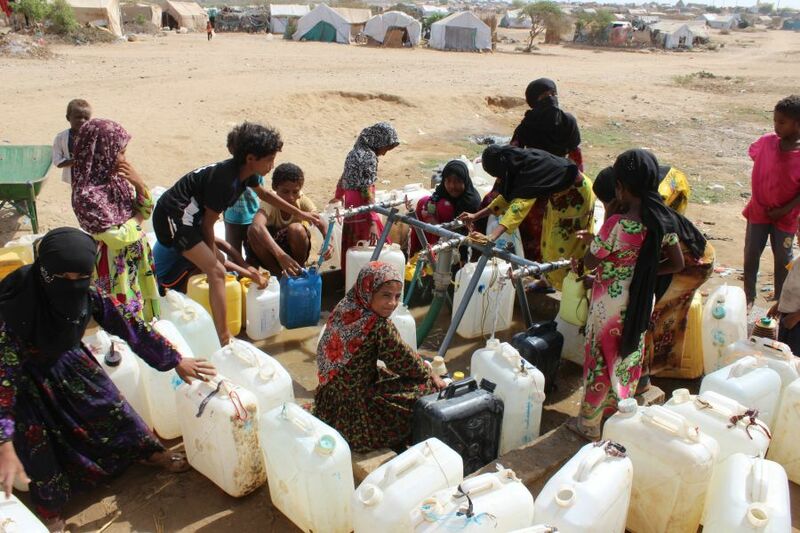 The people of Yemen are experiencing one of the world’s worst humanitarian crises. The conflict between a Saudi-led coalition of Gulf countries and the Government of Yemen against the Ansar-Allah movement (also known as the Houthis), which escalated in March 2015, has so far caused more than 17,000 civilian deaths and injuries. Over three million people have been forced to flee their homes due to the bombing and fighting. 24 million people – 80 percent of Yemen population – need emergency aid, the greatest number in any country in the world. The country’s economy has been shattered. Countless homes, warehouses, farms and vital parts of civilian infrastructure have been destroyed. Basic services, like health or water supply, are collapsing. The flow of food – nearly 90 percent of which had to be imported even before the conflict started - has been massively disrupted by the warring parties. Prices are continuing to rise, while many of the poorest people have lost their incomes. Now an estimated 20 million Yemenis, 60 percent of the population, are suffering from food insecurity and malnutrition, including 2 million children. According to the UN, 14 million people – half the population – face a clear and present danger of imminent famine. Besides, Yemen is facing the world’s worst ever recorded cholera outbreak, which has spread to nearly every corner of the war-ravaged country. More than 1.3 million cases have been reported and at least 2,700 people have died since the start of the epidemic. Many more are now at risk, already weakened by hunger and the effects of the ongoing war. We are delivering essential aid in the north and south of the country and have reached more than 3 million people across the frontlines, since July 2015. Supporting families with cash payments to buy food in the local market or livestock, and cash for work programs, so they get a possible source of income. In response to the cholera outbreak, we have directly supported more than 430,000 people from four governorates in coordination with other international agencies. We are delivering clean water, filters, jerry cans, building latrines and organizing hygiene awareness programs. Yemen faces the triple threat of war, disease and hunger. Continuing conflict, airstrikes and restrictions on imports have left 14 million people facing famine. For millions of Yemeni women, men and children, life remains a daily struggle and violence a constant threat. We are on the ground distributing life-saving aid, but we urgently need to reach more people and we can’t do it without you.